Charles Ryan's Flying Adventure: Life's A Peach! *Aircraft photos are credited to the following photographers from airliners.net. This airline came about only after I decided to fly to Tokyo to fly the 787 dreamliner that ANA was flying from Taipei Songshan to Tokyo. My original routing was TSA-HND-ICN-KIX-HND-TSA (Taipei SongShan-Tokyo Haneda-Seoul Incheon-Osaka Kansai-Tokyo Hanada-Taipei Songshan). Later on in Early August, I was invited by @QualityHunter (Thank you very much!) on Twitter to participate in the QualityHunter workshop in Helsinki hosted by Finnair and Helsinki Airport and that meant that I had to make some changes which was not a problem. 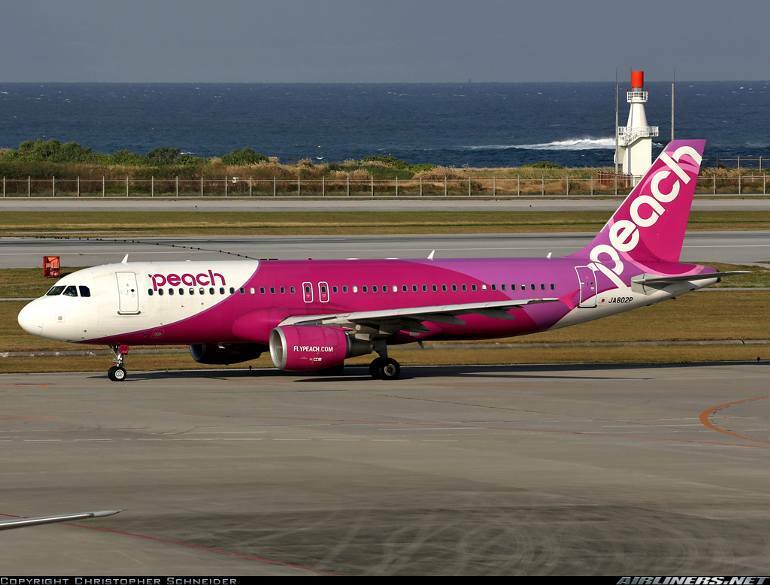 Peach is a low-cost carrier in Japan, one of the finest I have heard. So flying with this airline was a must for me. Once I finalize the date, I made my booking almost immediately. My final trip itinerary is Singapore-Taipei Taoyuan Taipei Songshan-Tokyo Haneda-Helsinki-Seoul-Osaka-Tokyo Haneda-Taipei SongShan Taipei Taoyuan-Singapore. I have decided to cancel my domestic flying in Taipei as I felt that I needed some rest in Taipei before starting work on Monday. The website is easy to navigate. It has different languages, so no problem for foreigners at all. The airline also offers 2 version of the website, the normal and the mobile website. However, the mobile website is not able to view your own itinerary, this means you have to use the normal website to access to it. Doesn't make sense if you ask me. Fortunately, the normal website is user-friendly on my Ipad so making the booking or changes is not a problem at all. Changes to my itinerary means I have to pay about S$140 for the change, that almost cost a new ticket, but because I wanted to meet up with someone and also to at least spend some time touring around Seoul, I decided to sacrifice a bit. 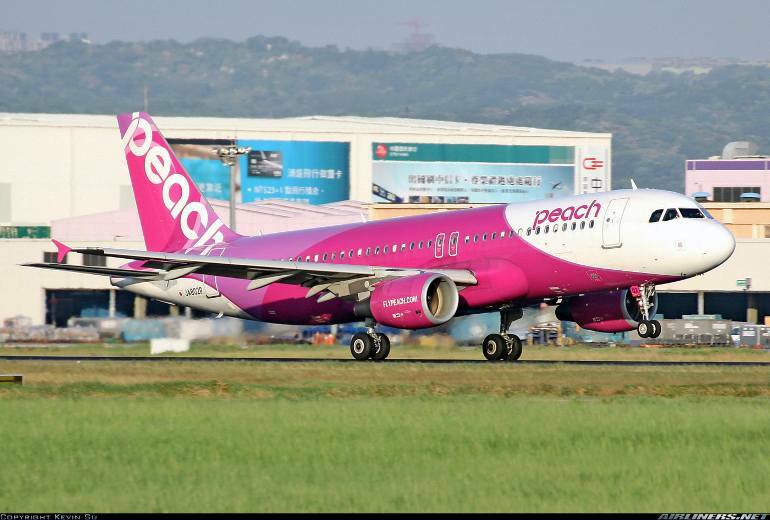 So if you guys decide to fly with Peach, do make sure the date and time is what you are looking for. Making changes with Peach doesn't cost cheap! When I look at this updated itinerary, I got confused. What the airline should have done is to send out 2 emails instead; one for the original flight (cancelled) and the other for the updated flight. When I looked at this, I wasn't too happy about it. One has to look carefully to avoid any confusion. So for this, I would give a thumb down! Do take note of the terms and condition! During check-in, the front desk staff identified a problem with my baggage, there seemed to be a hole on the underside of it and immediately she helped to use a scotch tape and taped it around the affected area, I was quite grateful for that. What a pleasant airport this is, its easy to get from a place to another, signs are everywhere, its unlikely that one will get lost. I have to say this has to be my favourite airport so far. Not only just that, there is strong free wifi everywhere and you don't need to register for it. A great airport for plane enthusiasts as its photo-friendly. The only feedback I have is for more eating places at the departure area. My 48th carrer: Peach Aviation! It was a pleasant experience boarding the aircraft. Passengers with seats "ABC" were to board first then the rest boarded after. This arrangement was new for me and it also worked out well for this flight. Once my turn came, I couldn't wait to step onto the plane at this point. The weather looks perfect for flying but that changed during the flight! The wonderful Japanese hospitality kicked in even before I stepped on board. the crew at the door was very welcoming and I felt at home already! Even though she was speaking Japanese to me, I understood what she meant. I passed her my ticket and she smiled at me and told me to where my seat was and wished me a pleasant flight! Unfortunately for this flight, I had to settle for a middle seat which meant that I had no chance to take any window shots. Photo was taken before my seat mate arrived. Fortunately, both of my seat mates were small-sized so it wasn't too bad squeezing myself in the middle. I think the next time I book, I will pay for the seat. Seat pitch was tight, it was about 31 inch I think. However, the leather seat itself was comfortable and I could handle for flights less than 2 hours but no more than that due to limited legroom space. The flight was almost full, I had a look at the rear briefly and there were only a few empty seats. We are in the air! The aircraft pushed back on time and we made our way to 33R for a quick departure. There was no updates from the flight deck regarding the bad weather in Osaka, so I presumed the flight would be smooth all the way. Boy! I was so wrong especially when the aircraft was near Japan. After the smooth take-off, the selt belt sign went off and the Japanese crew started its in-flight service. They were professional and friendly through-out. As the flight duration was short, they had to do things quickly. First they came around to sell food and drinks, but very few were interested. When the duty-free service started, there seemed to be an interest in it and I am one of them. I got myself a plane model and some key chains, the items cost me around 2700 Yen. From then on, it started to get bumpy and the seat belt sign came on. The crew were told to do a quick check on us before heading to their seats as the ride was getting rougher. It was a good timing too, just after the crew were buckled up, the "rollar-coaster" ride began and it frightened some of us especially the little kids. Some of them could be heard crying but the parents managed to comfort them! (Great job!) An announcement was made to reassure the passengers that the bad turbulence would not affect the operation of the aircraft and that was a nice touch! I felt that some soft music could be played at that time to help further ease the tension that all of us had to go through. Anyway, the plane continued to shake violently and we had lots of strong up-drift and down-drift as our plane flew through the clouds. The weather had gotten worse as we entered the Japanese area. I was wondering when would all this end, it seem to be taking a long time to descend and land. However, I wasn't frighten at all, I knew we would land safely somehow, but because of the violent movement of the aircraft, I wasn't feeling too good after the aircraft touched down. This nightmare lasted for 30 mins and even the approach to Osaka Airport wasn't smooth either, it was only when the aircraft's landing gears touching the ground surface, sighs of relief could be heard in the cabin. The landing was a great one. We were told then that we had experienced some severe turbulence but the pilots were experienced enough to handle the situation. Our plane landed at a remote parking lot at Osaka's terminal 2 which was catered for just Peach Aviation. Later on, I found out that quite a number of flights were either diverted or cancelled due to bad weather. We were one of the last one in. What's inside my seat pocket? Lots of interesting stuff in the seat content! Thank you JA802P for the ride! This airline has lived up to its name. I heard many positive feedback about this airline and I can say the same thing about this airline. The most important aspect about the flight is the in-flight service and the service was on board even though its just a Low-Cost Carrier, is excellent. The crew were friendly and professional, the cabin ambiance and the service was impressive. However, the airline could further improve itself; having separate emails for original and revised flights, constant updates by the flight crew or attendant regarding bad weather and a brighter cabin interior would be better; example: brighter purple seats. I would highly recommend this airline to anyone! 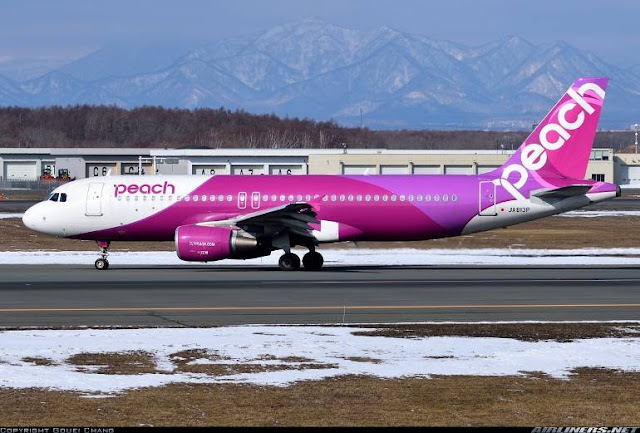 Fly with Peach without worry, this is definitely one of the top low-cost carriers around, you can assured of top quality service on board and on ground. Thank you for reading my trip report on Peach!